WHAT ARE POINT, NONPOINT, AND MOBILE SOURCES? Air toxics are emitted from many types of sources. These sources of air pollution are generally categorized as point, nonpoint, and mobile (on-road and non-road) sources. Point Sources: For the purposes of the 2005 NATA, a point source is a stationary facility or process whose location could be identified with latitude and longitude coordinates. Point sources include large facilities that emit a significant amount of air pollution during manufacturing, power generation, heating, incineration, or other such activity. They also include smaller facilities including those that are required to report their emissions under the federal Toxic Release Inventory program and the state's Community Right-To-Know program. On-road mobile sources are vehicles found on roads and highways, including cars, trucks, buses, and motorcycles. Non-road mobile sources include aircraft, trains, lawnmowers, boats, dirt bikes, construction vehicles, farm equipment, leaf blowers, and more. As part of the NATA process, USEPA prepares a comprehensive list of air toxics emissions for the entire country. This emissions inventory is reviewed and revised by each state before being finalized by USEPA. Although there are bound to be some errors in the details of such a massive undertaking, the inventory does give us a good indication of which are the most important sources of air toxic emissions in our state. As can be seen from the pie chart below, mobile sources are the largest contributors of air toxics emissions in New Jersey, with on-road mobile sources accounting for 33%, and non-road mobile sources contributing 29%. Nonpoint/area sources represent 31% of the inventory. The remaining 7% of the inventory is attributable to point sources. Note that this pie chart does not include emissions of diesel particulate matter. For a discussion of diesel emissions, click here. The 1996, 1999 and 2002 NATA results were discussed on this website previously, and can still be accessed by clicking 1996, 1999, 2002. However, USEPA emphasizes that the methods used to compile emissions inventories vary somewhat from year to year, so the results are not exactly comparable. 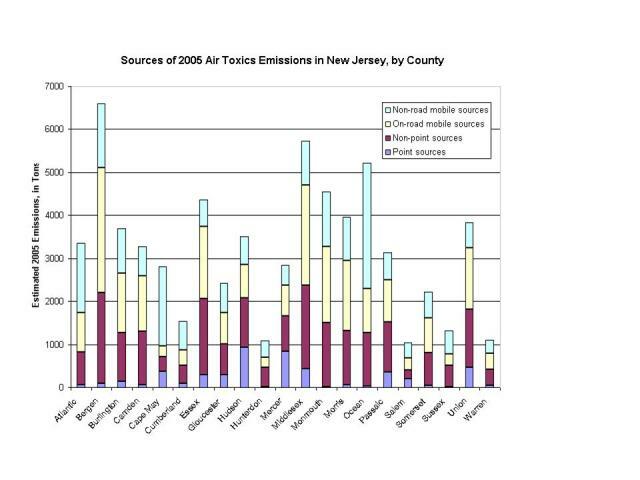 When the New Jersey emissions estimates are broken down by county, it is evident that the areas with the greatest air toxic emissions are generally those with the largest population. This is directly related to high levels of vehicle use, residential fuel burning, solvent use, and other population-related activities in those counties. Charts for 1996, 1999 and 2002 are available for viewing. However, USEPA emphasizes that the methods used to conduct emissions inventories vary somewhat from year to year, so the results are not exactly comparable. Concentrations of some air toxics are dominated not by local emissions, but by atmospheric transformation (or secondary formation) and by what USEPA refers to as background estimates. Background concentrations can be attributed to long-range pollutant transport, unidentified emission sources and past emissions. A detailed description of how USEPA came up with these "background concentrations" can be found on USEPA's NATA web site. Atmospheric transformation, also referred to as secondary formation is a process by which air pollutants are transformed in the air into other chemicals. When a pollutant is transformed, the original chemical no longer exists, but is replaced by one or more chemicals. Compared to the original pollutant, the newer reaction products may have more, less, or the same toxicity. Transformations and removal processes affect both the fate of a pollutant and its atmospheric persistence. The 2005 NATA estimated atmospheric transformation and subsequent ambient concentrations for three air toxics (acetaldehyde, formaldehyde, and acrolein), and atmospheric decay for one air toxic (1,3-butadiene decays to acrolein). For more information click here.